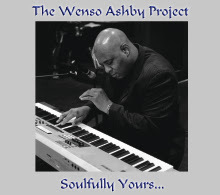 JAZZ CHILL : Featured This Week On The Jazz Network Worldwide: : The Wenso Ashby Project "Soulfully Yours"
Featured This Week On The Jazz Network Worldwide: : The Wenso Ashby Project "Soulfully Yours"
Wenso Ashby, a talented songwriter, producer, and keyboardist is known for his rhythmic inventiveness and collective improvisation. Wenso established himself behind the scenes in Washington, D.C. doing production in the late 1990's. He worked as a hip hop producer and session keyboardist at Oyaban Record's studios in Maryland and Virginia’s nationally recognized Cue Studio. Ashby was content in the background until artist’s manager Amanda Fielding prodded him to cross genres and start showcasing his playing and songwriting talents in smooth jazz. In 2002, Wenso recorded the well-received album Midnite Walkin’, then relocated to Minneapolis to promote the silken sound he dubbed “Contemporary Jazz with Soul”. Wenso Ashby has delighted audiences from coast to coast performing his style of music that embraces hard hitting groove based rhythms with timeless melodies and soulful vocals. It was this style that caught the attention of twin cities based Huber Entertainment that ultimately led to a distribution deal in 2008. With his 2011 release, “The Moment of Truth”, Wenso decided to once again be an independent artist. In his own words he is “Blessed” to share his gift with the world. Being an independent artist allows creative freedom to record and perform. He loves performing live on stages from small intimate 100 seat venues to large festivals. He has open up for national recording artists like Saxophonist Kim Waters, Bassist Gerald Veasley, and Songwriter/Singer Kenny Lattimore, Jason "Malletman" Taylor, and Idol winner Ruben Studdard, and Paris Bennett. He has appeared on network TV and his music can be heard both nationally and internationally.